The influenza virus is actually a group of viruses. They are classified into influenza A, B and C. Most years, influenza A causes more disease than influenza B while influenza C is of relatively little importance. Influenza A viruses are often further described by ‘H’ and ‘N’ numbers which refer to proteins found in the viral coat – for example the “swine flu” which appeared in 2009 was influenza A H1N1. “Flu” is short for influenza, which is a highly contagious viral illness which affects the lungs and throat. In the English-speaking world there is a tendency to refer to commonplace coughs and colds as “flu”. In fact these are caused by other viruses; true influenza is distinct from these illnesses and usually causes symptoms which are significantly worse. Influenza is a common disease which is present all year round, all over the world. However in temperate zones most influenza activity occurs during the winter months. This means that there are two flu seasons every year: one in the Northern Hemisphere and one in the Southern Hemisphere (tropical regions experience similar rates of influenza all year round). Flu seasons vary widely in their severity so some years will have many more cases than others. 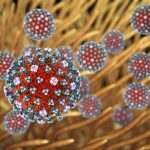 One of the most notable features of influenza viruses is that they have a tendency to change a little bit every year – new strains of influenza virus are frequently identified. People who have had influenza before, or who have been vaccinated against influenza, will have immunity to the influenza viruses they have been exposed to. But as the circulating influenza viruses change over time, that immunity becomes less effective. This is one of the reasons why some flu seasons are more severe than others. Occasionally an influenza virus will appear which is markedly different from those which have gone before. When this happens, the population has little immunity to the new virus and an influenza pandemic can result. This is a much-feared event which in the 20th century was responsible for large-scale loss of life. How does influenza virus spread? Influenza spreads very easily from person to person. Infected individuals will usually begin shedding viruses the day before they feel unwell until 5 to 7 days after they recover. Coughing, sneezing and even talking launches the virus particles into the air whereupon they can be inhaled by another person. Influenza virus can also survive for some time on hard surfaces such as door handles so it is possible for someone to get the virus on their hand and then become infected by touching their mouth. Although the list of symptoms is similar to those experienced by patients suffering ordinary coughs and colds, it should be noted that patients with influenza usually feel much, much worse than they would do from a simple cold. Influenza symptoms also characteristically start a lot more suddenly. The principal initial symptoms are usually fever, muscle pains and weakness. Cough and runny nose are less notable at the beginning but often develop later on. Children with influenza may also have diarrhoea. Patients with influenza will typically remain unwell for 5 to 7 days although the length of illness can range from 3 to 12 days. The prognosis in influenza is usually good: previously healthy patients who contract influenza are highly likely to make a full recovery from the illness. However, it is possible for a simple case of influenza to develop into an illness which is more serious and which can even be life-threatening. The most feared complication of the disease is pneumonia. This can either be caused by the influenza virus directly, or the influenza can predispose the patient to becoming infected with another bug which then causes pneumonia. Influenza may also cause serious illness by exacerbating medical conditions which patients already have (e.g. heart failure). This is not an exhaustive list; anyone with a serious ongoing medical condition may be at increased risk of serious complications of influenza. Are there any danger signs to watch out for? Most patients with influenza will feel very unwell and yet will make a full recovery. The following features suggest that an individual’s case is more serious and should prompt you to seek immediate medical advice. Drowsiness or withdrawal from interaction with others. How can influenza be treated? What should I do if I get sick? Clean and disinfect surfaces and objects which may have become contaminated. If you have any of the danger signs listed in the section above, you should seek immediate medical attention. You should also see a doctor if you are still unwell after 7 days. If you are in one of the patient groups which are at increased risk of complications of influenza (see above) you should see a doctor as soon as possible after you become unwell. This is because your doctor may want to give you an antiviral medication. How can I avoid getting influenza? Is there a vaccine? Simple hygiene measures will reduce your chances of getting influenza – see the section above for more details. If you come into contact with someone who has symptoms of influenza, or if you are caring for someone, you should wash your hands frequently with soap and water or use an alcohol-based hand rub. The best way of avoiding influenza is to be vaccinated. Governments of different countries make different recommendations about who should be vaccinated. In many European countries vaccination is targeted at patient groups who are at increased risk of influenza complications (see above). However in the United States the CDC recommends that everyone over the age of 6 months be vaccinated. Flu vaccination should be done every year. Ideally the vaccine should be given in advance of the flu season but there is no reason not to vaccinate once the season has started. Just one dose of the vaccine is required, with immunity developing within two weeks. Vaccination is usually given as an intramuscular injection. In some countries influenza vaccine is given to children as a nasal spray but this is not currently recommended in the United States by the CDC. Influenza vaccination is never 100% effective because it cannot provide protection against every type of influenza which is circulating. 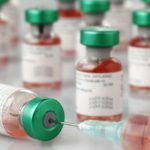 In fact, virologists have to make a decision about six months in advance of the flu season which strains of virus to include in the vaccine – in other words they have to guess which strains will be most prevalent during the coming winter. The accuracy of these predictions influences the effectiveness of the vaccination which is usually judged to provide 40-60% protection. Patients known to have severe, life-threatening allergies to influenza vaccination or to one of the ingredients in the vaccine. Patients who have previously had Guillain-Barré syndrome. If you are unwell on the day of your influenza vaccination you should delay having the vaccine until you are feeling better. What is the story so far with this year’s flu season in the temperate Northern Hemisphere? In North America this year’s flu season has been unusually active so far. Widespread and intense transmission has been reported in the contiguous 48 states of the United States. Current activity is the highest since the 2009 “swine flu” pandemic. As of week 3 2018, case numbers in the United States are continuing to become more frequent. It is impossible to predict at what point case numbers will peak but once they do, it is usual for activity to decline steadily for the remainder of the season. The majority of cases in North America this season have been influenza A H3N2. H3N2 is believed to be more likely to cause severe illness in high-risk groups than most other viruses in the influenza family. Parts of Western Europe are also seeing unusually high levels of influenza transmission this season, notably Ireland, Wales, Spain and Italy. Eastern European countries are reporting lower levels of influenza activity. In contrast to North America, most influenza cases in Europe this season have been influenza B. Central Asia is reporting low levels of influenza so far. 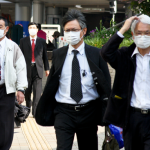 China and Japan have reported high levels of influenza activity, mostly influenza B. This year’s influenza flu vaccine has been judged to be 30% effective. This is lower than is achieved most years. Overall this is already a bad year for seasonal influenza and it remains to be seen how much further influenza transmission will increase. The intensity of this year’s season has already generated a lot of media attention and public concern in the United States. Individuals and organisations located in areas of high transmission should consider now what they can do to avoid being affected by influenza. Take note of the hygiene tips detailed above to decrease the chance of catching the disease from others. Ensure that staff who are ill do not come into work.